I first came across the work of filmmaker and artist Wu Tsang this summer, on a flying visit to Nottingham Contemporary on the occasion of her major (and first) solo UK exhibition Devotional Document (Part I). 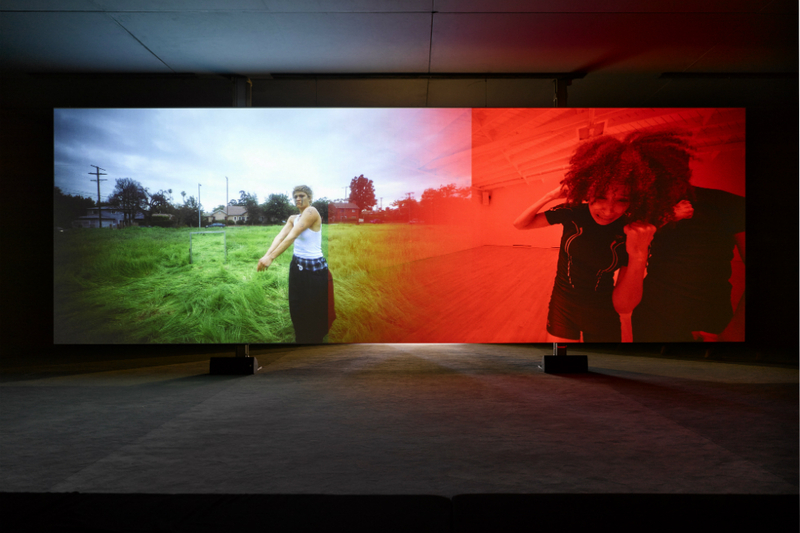 The work was highly accessible but questioning (in the form of two film installations and video); and it was installed in such a way that you knew immediately this wasn’t a typical ‘white cube’ experience. The brief encounter was a serendipitous one, flagging that Tsang, who has just been nominated for the 2018 Hugo Boss Prize (the winner of which will win $100,000 and a solo show at New York’s Guggenheim) would be presenting additional new works later in the year at FACT Liverpool. 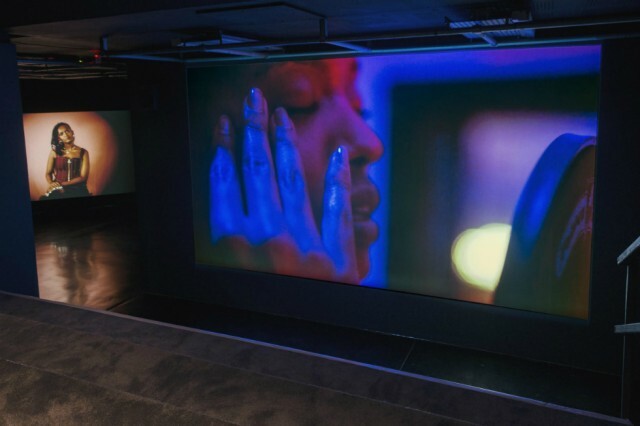 That presentation, Under Cinema (which opened in October), comprises a pair of 2017 films: a new commission of the same name featuring American recording artist Kelela, and a UK-first showing of We Hold Where Study. Although there is no prescribed sequence in which to see the works, beginning on the ground floor means immersing yourself first into the world of the latter. Entering the dark gallery space, you are presented with the option of a seat on a long bench, or a bean bag on the floor, nearer to the action. Initially, at least, action isn’t quite the right word. The 19 minute film begins with two boys at play in a field on what looks like a bright, balmy morning. Testing boundaries, fooling around, it all seems innocent enough; then, the smaller boy of the two confronts the camera with a look just shy of aggression – his gaze is a fiercely inquisitive one. The action proceeds across two channels screened side-by-side. On the left the prologue played out by the two boys I’ve just described, is followed by another pair of performers (regular Tsang collaborator Boychild, and Josh Johnson) in the same field. Respectively, we move from dawn to hazy twilight. To the right, juxtaposed with this outdoor narrative is an indoors one, taking place in a dance studio and performed by Ligia Lewis and Jonathan Gonzalez. On either screen or both taken together, it isn’t immediately clear what is going on from one moment to the next; this is not a criticism. In fact, this lack of spoon feeding is refreshing. 19 woozy, dreamlike minutes pass quickly; the narrative is regularly, at times deeply poetic, and always affecting. Just like the boy in the prologue, we have questions too – are we watching the journey from relatively untroubled childhood to the often fraught negotiations that beset adulthood? The camerawork plays its part. If not disorientating, it serves to discomfit and disturb against the steady drone of the soundtrack; the struggles and wrestling embraces of the performers are executed with a physicality that is wholly impressive, at times mesmeric. Perhaps the film’s tracing of dawn to dusk, youthfulness to maturity is, in fact, a take on the travails of adult relationships, while the indoor and outdoor settings are suggestive of our interior lives and that which we are prepared to reveal externally. Possibly it is both or neither of these things. The film is a response to Fred Moten and Stefano Harney’s essay Leave Our Mikes Alone, but its power is such that you needn’t have any prior knowledge of this piece of writing. Indeed, it seems entirely relatable to a given viewer’s particular perspective. We have all been subject to life’s subtle and not so subtle adversities, compromises and negotiations after all. This is a nuanced work of layers that, although sometimes feels like an assault, will stay with you for some time after viewing – as much for the beauty of its deft performances as its not-always-latent violence. Emerging from this figurative and literal darkness, the ascent of the stairs to see world premiere Under Cinema in gallery 2 affords you some psychological distance, allowing the brain some respite, to reset itself in preparation for whatever follows. The gallery has been installed with tiered, bleachers-style seating. Despite or because of this contextual shift, understandably some tonal jarring occurs. Indeed, to begin with, it feels like we’re watching nothing more than a promo. In other hands that’s all it might have been, but between them, Wu Tsang and Kelela imbue it with a rich depth, elevating it from this potential fate. We are first introduced to Kelela of five years ago. Looking very young, she is framed as just another raw, albeit precocious, aspirational, wannabe pop star. Flash forward to near present day and we see a more mature adult woman in the studio, recording her debut album, Take Me Apart. The difference those five years has made is striking. Unlike the first film that occupies the ground floor, this time the journey from callow youth to maturation feels on the whole a positive one. Here, we are confronted with a savvy, self-aware and self-possessed woman. She knows what part aspects of the music industry would have her, as a black woman, play. Putting herself in the shoes of the industry execs, she understands “…the currency of culture that you come with”. “You’re great”, she affects facetiously. “We’d love to make some money from you.” She has no intention of being another victim of this toxic dynamic. And yet, she reflects, so much of pop is about exploring and exploiting “painful experiences”. We see her in more joyous mood at Afropunk, a music festival that champions, and I quote from its website, “… multiculturalism and diversity for people of all races, genders, colours, creeds and tastes.” She is at home here, and knows that the audience is there to celebrate and enjoy her performance rather than appropriate it for financial and cultural capital. This is all watched over – on a second screen to the left – by an at times brooding, at times quizzical, always no-nonsense, silent, basilisk-like Kelela. This screen adds a different dimension to the work (one hindered somewhat, depending on your vantage point – your view can range from peripheral to entirely restricted). It puts you at a slight remove from the typical one-way hypodermic transmission of the traditional cinematic relationship, meaning you never watch the narrative unfold blankly. It also feels a little like she is in the room with you, watching you. Slightly unsettling – your eyes are drawn from the main screen to check for Kelela’s responses – it allows for seeing the still-skewed relationships of the music industry from another perspective. It’s a subtle, effective device. A footnote to this film is that the aforementioned Take Me Apart was released by Warp, an indie label – home to the likes of Aphex Twin, Grizzly Bear, Boards of Canada and Battles – not known for chewing up and spitting out its talent. Taken together, the two films that make up Under Cinema complement each other largely successfully. Yes, to some the pairing may seem at first incongruent. But rather than compromising the artistic endeavour, the abstract We Hold Where Study is offset beautifully by the more immediate and accessible docu/art/pop mash-up of Under Cinema, and vice-versa. It’s a creative and experimental risk by Wu Tsang, but one that pays off, and richly rewards repeat viewings.